Who would have thought, in every delicious dishprepared and served by the celebrity chef and popular singer, Dato’ Fazley Yaakob, 40, stored a magical potion that made each and every menu enriched with delight that makes it memorable in mind. Without hesitation in sharing the special mixture in his cooking, the father of four uses people most preferred product – VHalia, a multigrain beverage from GoodMorning, which is rich in nutrients that benefits the eatery. 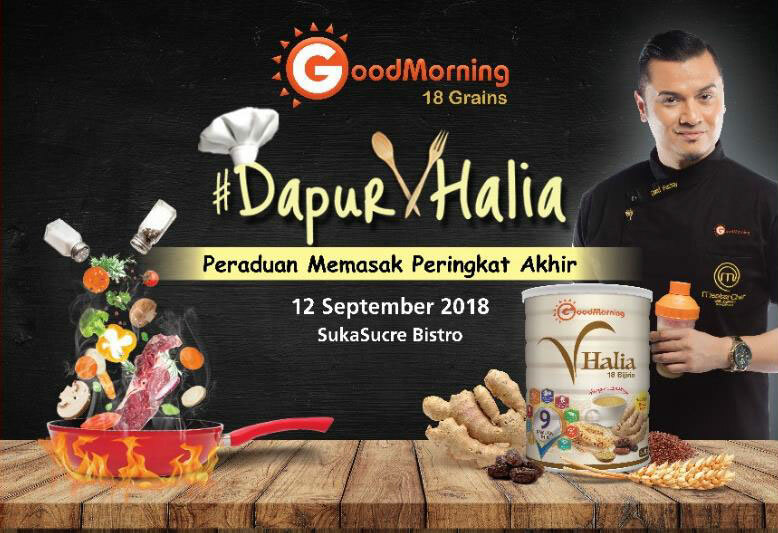 Considering it as a great honour to be part of GoodMorning VHalia campaign, the former champion of MasterChef Celebrity Malaysia 2012 said, he is always being selective in promoting products especially health goods that involve general health status. “Besides practice consuming GoodMorning VHalia every day in the morning, the great taste of it makes me incorporate this product in my cooking. Moreover, its high in nutrient content and it is a number one multigrain beverage brand in Malaysia since it was founded in 2008. “Don’t be surprise as I have created quite a number of recipes using GoodMorning products to produce fancy food such as pancakes, pasta, rendang and many did ask me about the secrets of my cooking. “As an individual that practice healthy lifestyle, I believe in every multigrain beverage from GoodMorning because of its high nutrition, easy to prepare and delicious. 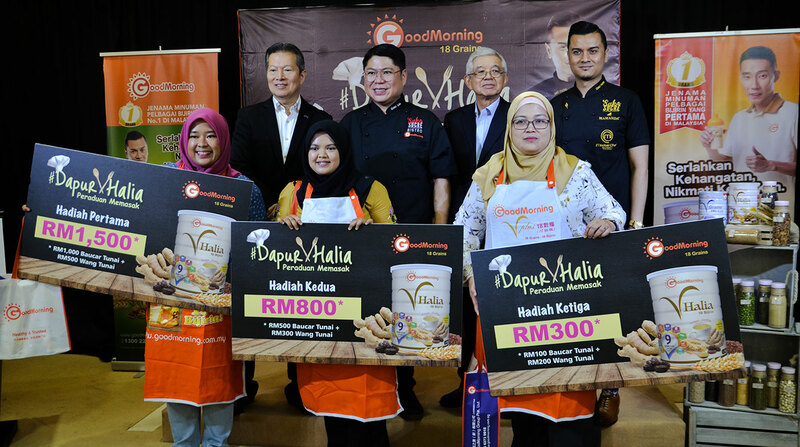 Most importantly it is a healthy product that is suitable for the whole family,” he said during the eventannouncing the winners of Deliciously Healthy #DapurVHalia cooking contest that was held at Event Hall RYU @ SukaSucre Bistro in Cheras today. Also present at the event was Founder and the Chief Executive Officer of GoodMorningGlobal Dato’ Dr. Lim Sin Boon, YB. Tan Sri Dato’ Seri Dr. Ting Chew Peh, the Advisor to GoodMorning Global, and the Senior Corporate Advisor, YB. Datuk Seri Garry K.S. Chua who is also the President of Malaysia Retail Chain Association (MRCA) and owner of Imperial Chakri Palace Thai Restaurant. He further mentioned that he is ambitious to see housewives or restaurant owners to serve GoodMorning VHalia multigrain beverage and use them in their cuisine as they are able to balance the human health aspect as well as increase the delicacy of the food provided. Meanwhile, Lim shared about the competition saying that a total of 6 participants were selected to showcase their ability and cooking skills by using GoodMorning VHalia. “Most people have the perceptions of healthy drink and food does not taste good. But for GoodMorning, it can be delicious to consume. That is why, this contest was held to create awareness that healthy food can be delicious, less hassle and appetizing for consumers. “Nutrition practice in daily diet proves to be one of the factors that contribute to health & wellbeing. Therefore, it can promote a healthier lifestyle while increasing productivity in our daily routine. This competition is organised to instil public awareness about healthy lifestyles in the community and to unite everyone regardless of race, religion and background,” said Dato’ Lim. 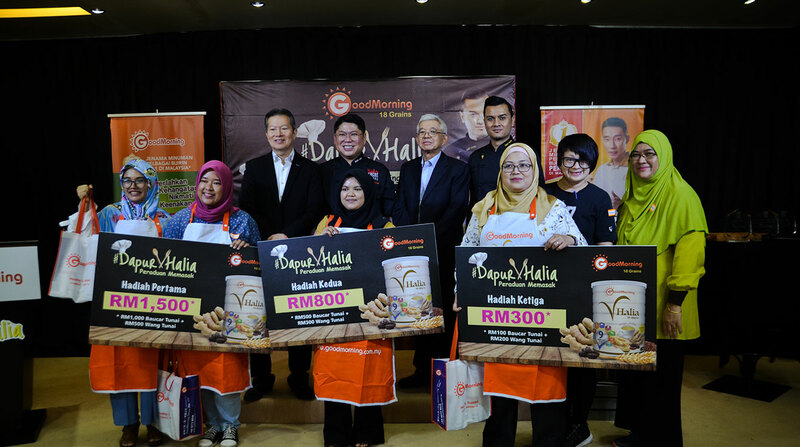 Participants of this contest used GoodMorning VHalia as the main ingredient in their culinary dish. It is not just a multigrain beverage but it’s the “kehangatan” balances the dishes prepared by the participants. GoodMorning VHalia is multigrain beverage that contains 18 types of whole grains and 9 unique ingredients. 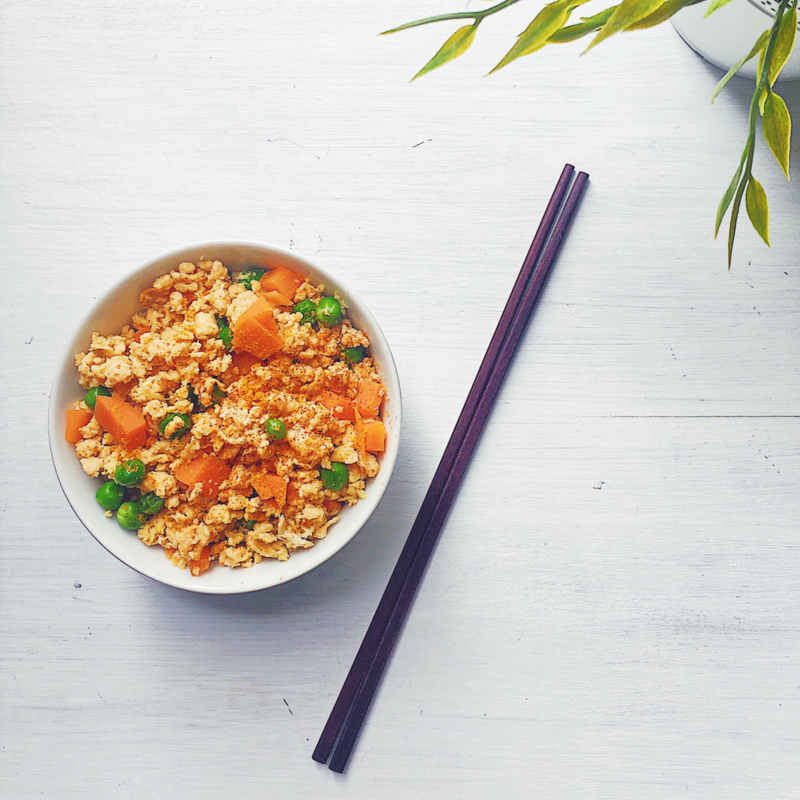 Bamboo Ginger gives a richer aroma and taste, has rich in antioxidant and fibre that primarily promotes digestion. It also contains Gingerol and Shogaol that helps to warm body, calm nausea and help to reduce cholesterol, lower down high blood pressure. GoodMorning VHalia is available at a retail price of RM47.00 for a can of 1kg and RM10.20 for the convenient pack of 8 sachets at all Guardian, Caring, Aeon Wellness, Tesco nationwide and other selected pharmacy chains. For more information on GoodMorning VHalia and other GoodMorning Global products offered in Malaysia, please visit GoodMorning website at https://goodmorning.com.my or GoodMorning 18 Grains Facebook page. Since the goods and services tax (GST) was abolished, I started hunting for restaurants which offer good value for money. 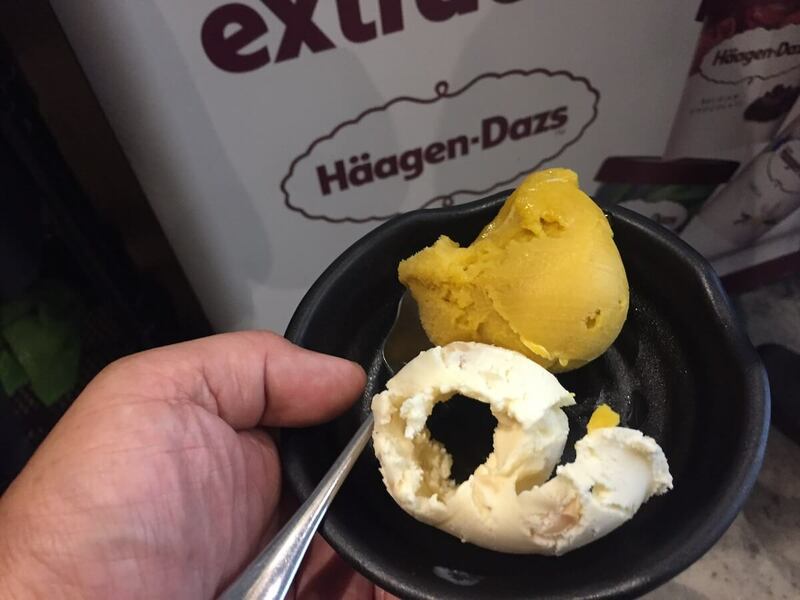 Imagine paying only RM49.90 for weekday lunch or an additional RM10 for their weekday dinner offers, and you get free flow of Haagen-Dazs ice cream. Although there is an additional RM5 surcharge on the weekend, the idea of having free flow of the American ice cream is simply crazy. This is what an ice cream lover like me particularly likes. Even if you are a small eater, the ice cream alone is worth the money especially when you are entertaining some clients. For their buffet packages, they supply Australian beef and lamb. All the food and meat are refillable. 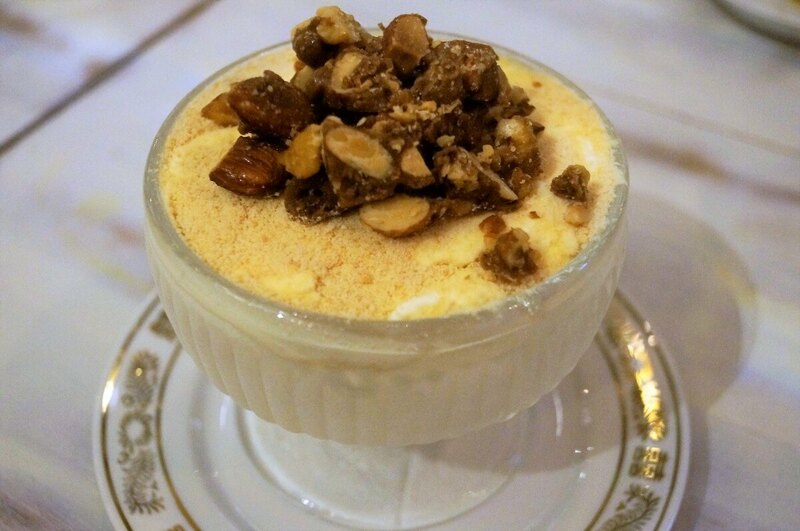 For their value set lunch priced at RM29.90, customers are only allowed one scoop of Haagen Dazs ice cream. 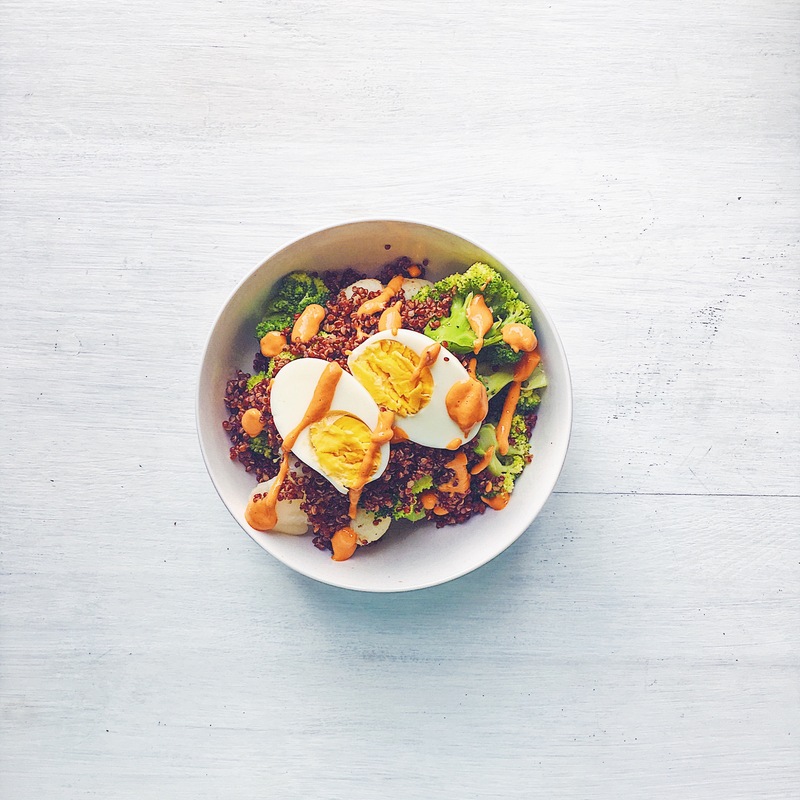 The idea was first conceived by Alvin, a former banker, whose passion has always been spending time in the kitchen whipping up a good meal for the family. After working a few years with a local bank, he decided he wanted a change in his career. So, together with his brother, Daniel, the duo ventured into a Japanese steamboat restaurant together. Both were with the banking and corporate finance industry in the past. 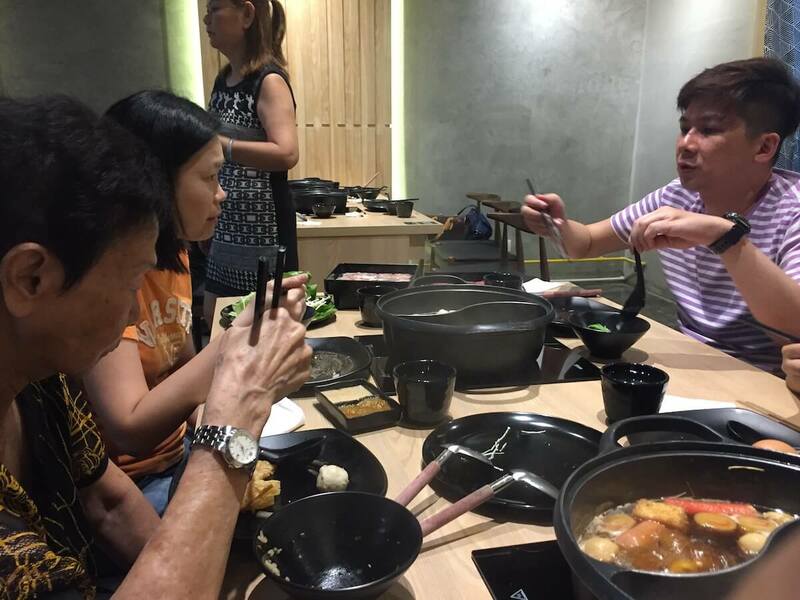 Being food enthusiasts themselves, they experimented with different tastes and came out with their own version of steamboat. 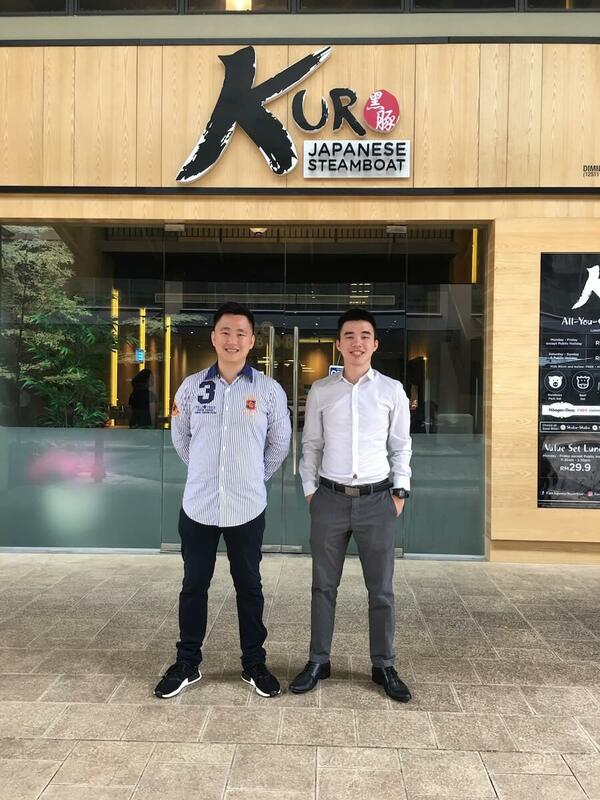 That was how the duo established Kuro Japanese Steamboat at Plaza Arcadia in Desa City Park. “The name ‘Kuro’ comes from the pork meat known as Kurobuta, which translated, means ‘black hog’,” explained Alvin. There are four recipes of broth: the Kuro broth (Pork broth), Japanese curry, Sukiyaki and Shabu-shabu. “The recipes are created by Alvin himself,” Daniel added. I particularly like their Kuro broth and the Japanese curry because they taste unique, especially when you cook their signature dish, the Kurobuta pork. According to Bosco, the Kurobuta pork is known as one of the highest-quality types of pork in the world. 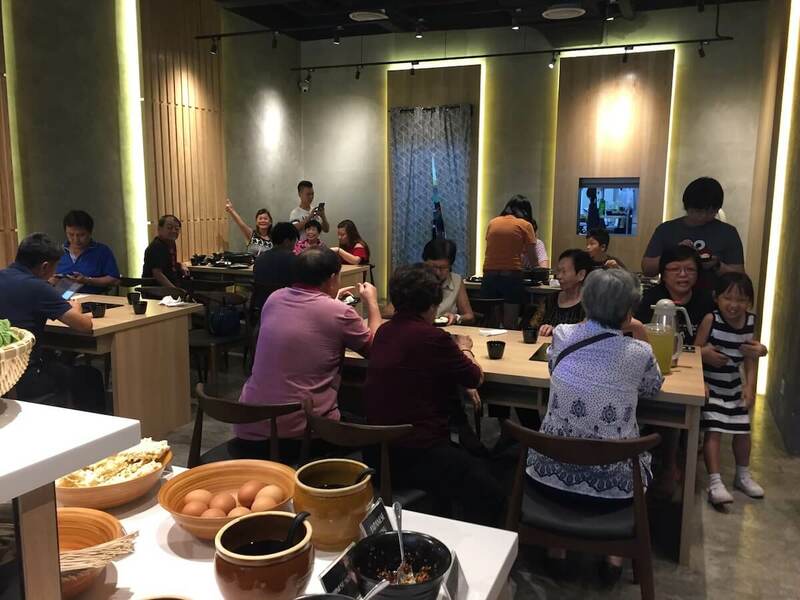 Kuro has a value set lunch priced at RM29.90, which is only applicable from Monday to Friday to cater more to office staff who want an outing together. 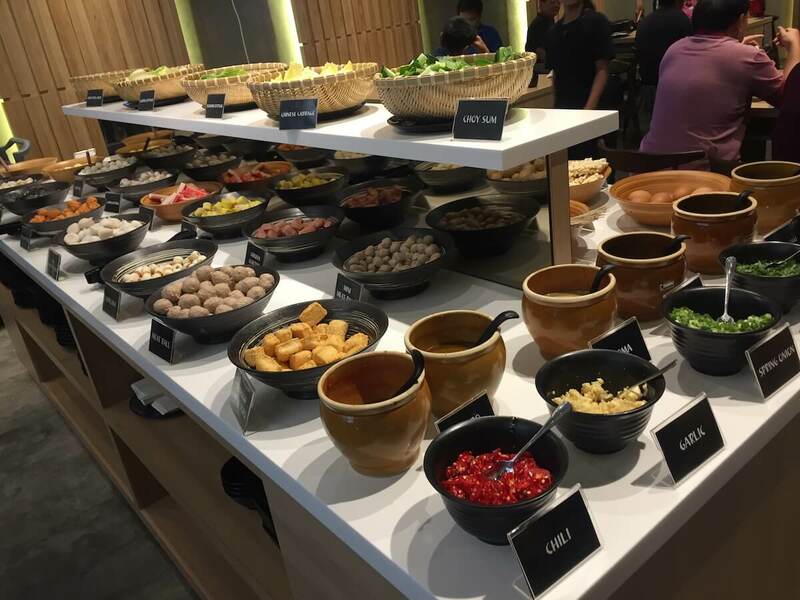 For the set lunch, each person is entitled to one meat plate serving, unlimited refill at the Kuro buffet bar, and a single scoop of Haagen Dazs ice cream. 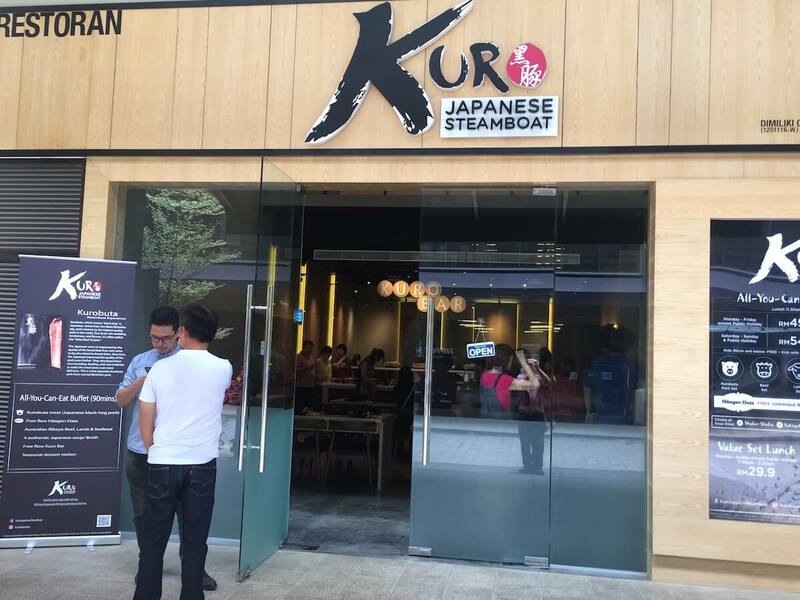 Kuro Japanese Steamboat restaurant is located at Block F-G-3 Plaza Arkadia, No 3 Jalan Intisari Perdana, Desa Parkcity. Opening Hours: 11.30am – 3.30pm (breakfast or lunch), 6.00pm – 11.00pm (dinner). Seven days a week. Redza Shahid (29) Co-founded Grub Cycle in June 2016. At first, Grub Cycle had 4 cofounders Asyraf, Hawanisa, Chacha and himself. The idea of starting up a social enterprise was first conceived when he was still doing his University studies. He realised that he needed to do more than what he was learning in the University so together with his friend they joined and volunteered in several charity organisations to help out orphanages and to paint houses. At that moment he was working at an investment company and the boss gave him an idea of how to start a social enterprise and fully encouraged him by submitting his name to a social enterprise programme then, organised by MaGIC in early 2015.
model, leaders of social enterprise, and other topics that are related to social enterprise. After one year, he was told to upgrade his position by deciding whether to join a social enterprise or to start on his own. 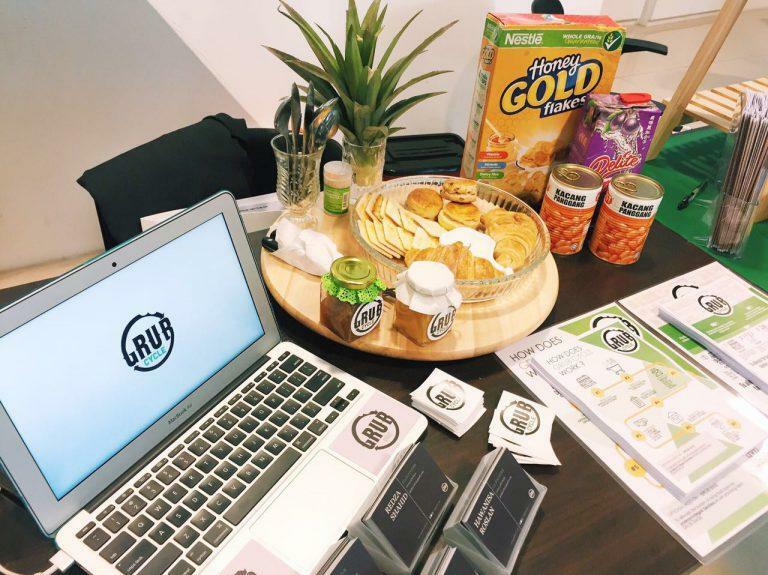 In December 2016, Redza and the other 3 cofounders successfully raised up to RM 1 million grant and at that time there were a few investors that wanted to invest in their social enterprise. Grub Cycle has 3 stakeholders that play crucial roles, the Co-founders, Investors and Consumers. The main purposes of Grub Cycle are, firstly, to reduce food waste in Malaysia while the other companies are focusing more on food composting. Redza believed that rather sending the food for composting, the edible food should be sold at a lower price. Secondly is to reduce daily expenses for their consumers, in fact, the grocery price had increased by 25% since 2010 but, the average salary in Malaysia has only increased by 20% within the same period. Lastly, Redza’s personal reason was a hope of attraction and encouragement towards other potential social entrepreneurs by involving himself in the social entrepreneurial industry. Since Grub Cycle launched back in 2016, it has emphasized its focus on reducing food wastage and ensuring that the low-income community can spend less money on food. So the question is what has been done in order to bring this idea to life. 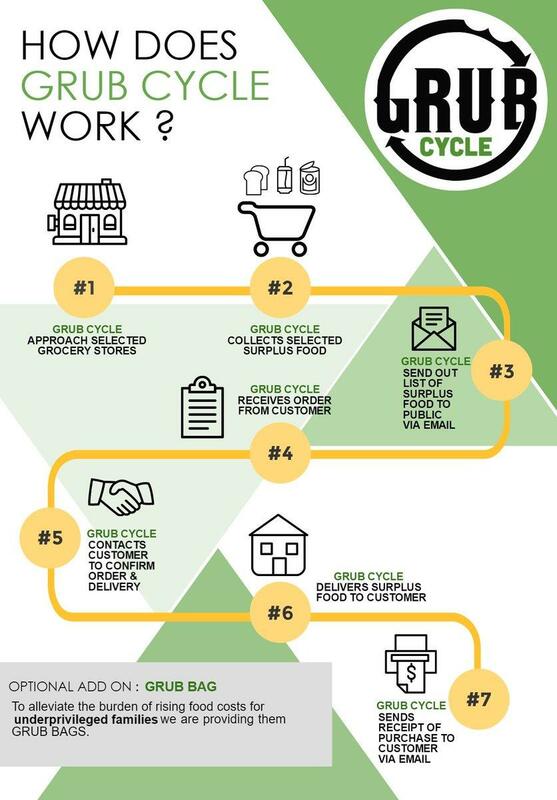 Below are some of the Grub Cycle offers to the public and how they can reach out directly to their customers and community. A survey was conducted and it was discovered that there is an increased amount of food waste from local supermarkets and about 15,000 tonnes daily wastes from these supermarkets. 3,000 tonnes out of the 15,000 tonnes will still be edible and 10% is from groceries and supermarkets. This is because 30% – 50% of the products that are shown on the shelves in the supermarket are being thrown away. Grub Cycle obtains surplus food products from their partner supermarkets at an affordable price. 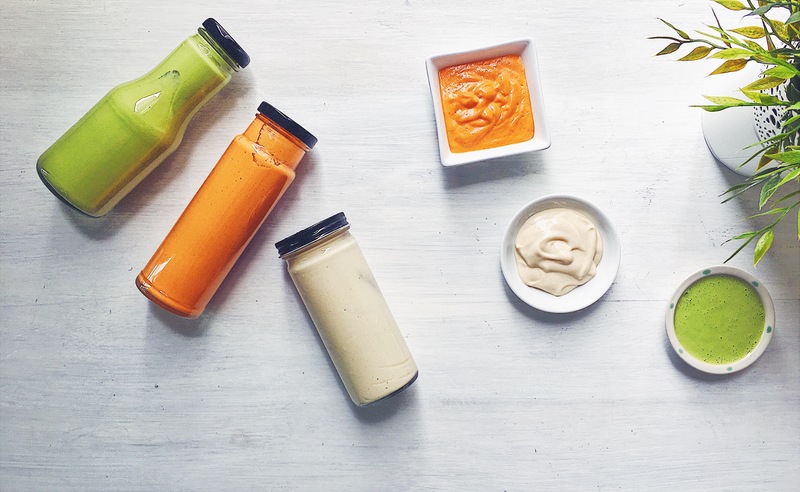 These products are either 1 – 3 months from the expiring date. However, these products will be fully ensured and validated for their edibility. Grub Cycle will then sell these items from the website, mobile app or any other means convenient to their customers and delivered to them at no delivery cost. This is like a mobile kiosk but in form of a food truck. It will be visiting low-income community areas 3 hours a day selling surplus food directly to the low-income community. However, If the customers are technology literate, they are able to order and buy online. With this Grub Homemade, Grub Cycle improvises by turning surplus fruits or vegetables that might have been deemed rejected by the supermarket or that is not into a farm-to-table product. Examples include cabbage kimchi, pineapple jam, apple cinnamon and chili chutney. Grub Cycle in-house Chef-In Residence meticulously develops recipes based on high-quality food commodities that would otherwise go to the bin. Don’t worry: they are not recycling expired goods. Grub bag is one of the ways the Grub Cycle gives back to the community by subsidizing low-income families’ food essentials. It comprises of rice, cooking oil, sugar, salt and eggs. Grub Cycle delivers Grub Bag to the families on a monthly basis with the hope to lessen the burden of the families in need & empower their economy! But this model is rarely. On launching the social enterprise, there are three main objectives that have been driving Grub Cycle daily to maximum productivity. Measuring their social impact performance could be done easily by comparing the KPI (Key Performance Index) of these main objectives. These objectives can be considered in a way that Grub Cycle has been contributing heavily to the socioeconomic needs of the society. ucts that are shown on the shelves in supermarkets are being thrown away based on the survey. Grub Cycle buys these surplus edible products from the grocery stores at a lower price which encourages the grocery store to still make money out of what was meant to be wasted. Lastly, Grub Cycle will sell these products to their customers below market price. Another way Grub Cycle has been preventing wastage of food is by collecting the fruits or vegetables that had been deemed unsellable due to their shape for instance. They are then turned into a farm-to-table product. This is through Grub Homemade model. So, as individuals, how can we personally prevent food wastage or what can we do about food wastage? As a retailer, you can reduce the price of those imperfectly shaped or shapeless vegetables or donate the unsellable yet edible surplus grocery food to those in need rather than disposing of them. Revising those sell-by expiration dates so that the perfect and safe food products are not discarded. Raising awareness on food wastage education such as what Grub Cycle is doing should be highly encouraged. Food that is not fit for human consumption should be fed to the animals. As an individual consumer, you should be more careful when shopping and only pick the necessary things. We can also use better methods to store and recycle leftovers and request smaller portions in restaurants. Food wastage pyramid is based on garbage, so as policy-makers, they can enhance the ability of producers, retailers and consumers to turn that pyramid around. With all that Grub Cycle has done and measuring their social impact performance to prevent food wastage, Grub Cycle has also managed to save 2201 kg of food from being wasted and this number is still increasing. Foodies will get the satisfaction of their money’s worth with every inexpensive purchase. To reduce daily expenses for customers, as a matter of fact, the grocery price has been increased by 25% since 2010 but the average salary in Malaysia has only increased by 20% within the same period based on a survey by Grub Cycle through an interview. With this issue at hand, the low-income community is unable to make ends meet when it comes to buying food or grocery products. But with the Grub Grocery and Grub Mobile, all those low-income community areas are able to have direct access to a below market price surplus food. Grub Cycle Co-founder has taken pride in himself to be someone who really cares about the less privileged community and he constantly encourages other entrepreneurs to also contribute to the community positively. So Grub Cycle encourages everyone to become an agent of change in their respective community. 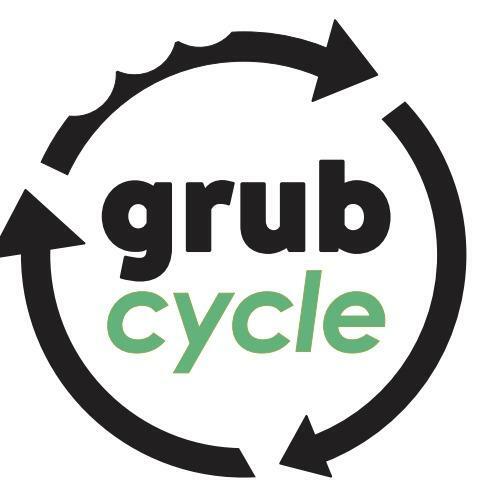 This can be done by buying from Grub Cycle because with each item sold, a percentage of Grub Cycle’s profit will benefit the underprivileged. Till date according to the Grub Cycle website as at the writing of this article, 250 Grub Bags had been delivered. manufacturing companies, municipalities, supermarkets, restaurants, and the federal government start applying practices and critical strategies for decreasing food waste. Take Malaysia, for instance, food waste is a huge problem. Based on the SWCorp Malaysia, a government agency which deals with solid waste stated that they generate 38,000 tonnes of waste per day and around 50% of the solid waste is food waste. Moreover, out of 50% of solid waste, 60% of waste that going to landfill is still edible which in fact, that could have fed 2,000,000 people. SWCorp has also stated that food waste can increase up to 50% during the festival season. There have been many movements to combat the food wastage in Malaysia. There are groups trying to recycle the food that is unsaleable at supermarkets. One of them is the Grub Cycle. Grub Cycle is a part of the global movement to combat and decrease food waste and to save the environment. There is a creative way that was used by people from all over the world to combat food waste such as creative marketing incentive that celebrates “ugly” fruits and vegetables. Grub Cycle itself has launched a Grub Mobile which is the first mobile kiosk and it is located in Bukit Lanchong. According to Grub Cycle website, they have contributed towards saving approximately 2,201 kg of food, saving the consumer expenses of around RM 20,958 with 250 Grub Bags delivered. This proves us that the Grub Cycle model is really working and the effects have also made impacts on people such as, firstly reducing waste by saving edible surplus food from cafes and grocery stores from being thrown away. Secondly, is saving money which foodies will get their satisfaction with their money’s worth with every inexpensive purchase. In the future, Redza hopes that there are other social enterprises with the same passion and mission as similar to Grub Cycle to combat food waste. This will enable us to work side by side and cut down on the food waste in Malaysia. Redza believes that there are not enough social entrepreneurs to bring about positive changes to the community and environment. 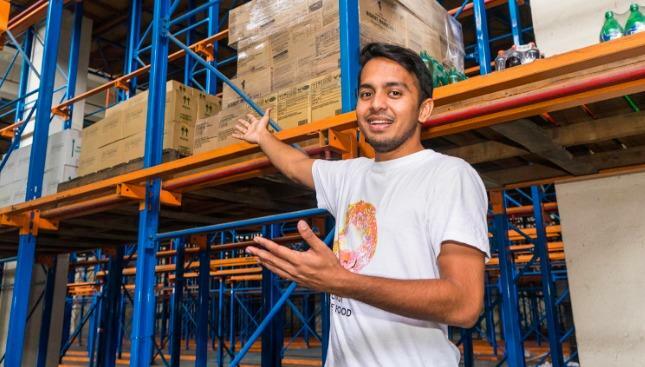 If there are enough social enterprises contributing to the same mission similar to Grub Cycle, food waste in Malaysia will cut down to the maximum level. WHAT TO EXPECT IN THE FUTURE FROM GRUB CYCLE? Grub Cycle is planning on having their own physical grocery supermarket here in Malaysia as a start before the end of this year 2018. With this kind of push, it can change perspectives on food wastage and bring positivity towards the idea of preventing food wastage. It will also be easier for the low-income community to purchase their grocery products at a lower price. Grub Cycle is also looking forward to expanding within the South East Asian Countries like Singapore for a start. Our body is created to detox naturally. Organs such as liver, kidneys, lungs, lymph, colon, and skin do the job. If we are feeding our body right and eating well, our organs would be able to detoxify our body as it should be. Problem only occurs when we are overloading our body with toxic substances. Our body can’t keep up and in turn become “faulty” and that’s when we fall ill and diseases creep in. A big part of it is contributed by food that are heavily refined, processed and manufactured with chemicals and artificial products. And it’s okay to be eating them especially if we enjoy them (I mean who can really say no forever to a bag of chips right? ), but the key is moderation. 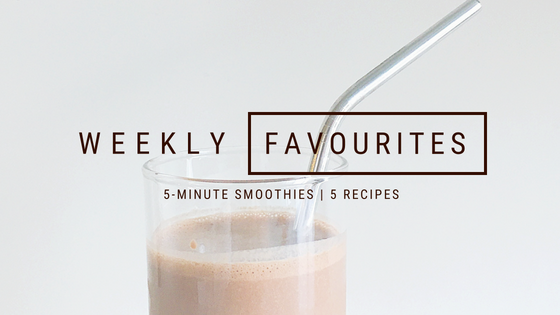 You can learn more about how I stay healthy whilst enjoying my sweets and fries here. I’m a big believer of moderation and balance when it comes to life and food, and I personally find elimination diets not sustainable and neither is it healthy for our psychological and mental state. 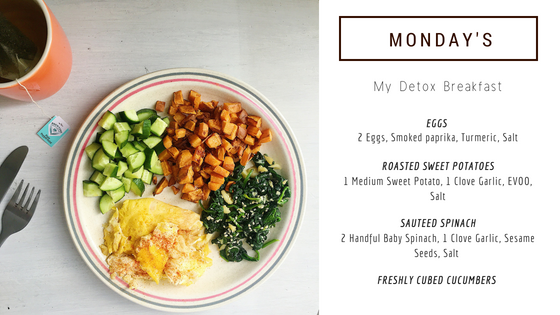 I’ve written on 80:20 rule that I adopt in helping me achieve moderation and to live healthily, sustainably here. The only time I would practice “elimination” would be during my “detox week/s”, which I try to do semi-annually, just to give my body a rest once in a while from all things refined. I thought as I prepare meals for myself, I’d document them and have those recipes written out for you. 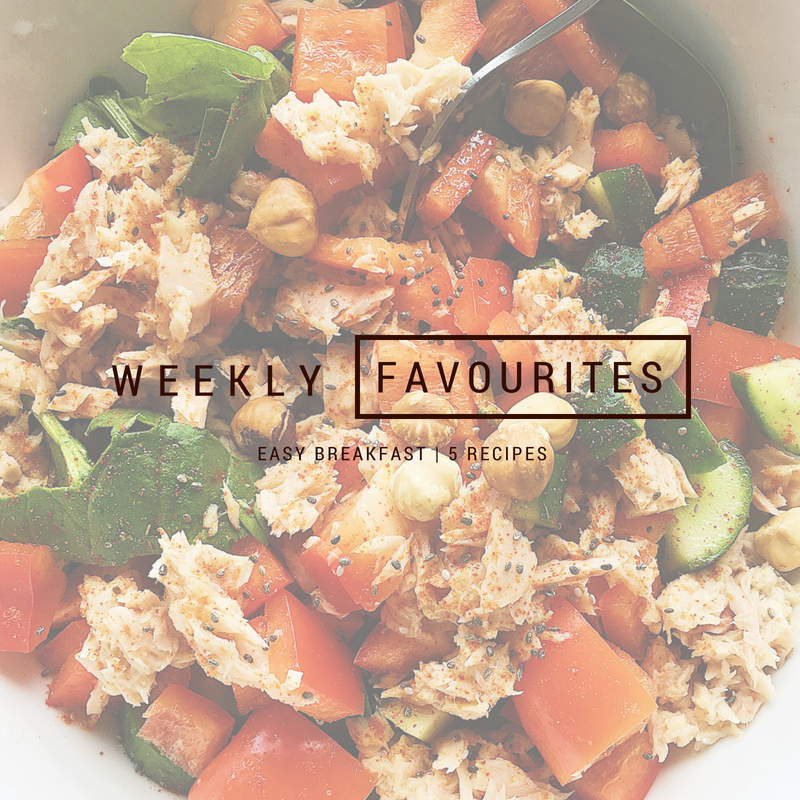 They are nothing fancy, just basic nourishing breakfast meals that you can put up in a jiffy. As potatoes are roasting in the oven, add chopped garlic into an oiled pan. 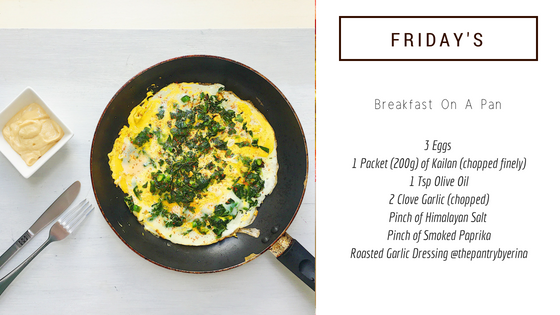 Fry till it’s slightly golden, and add baby spinach. Let it sit and stir occasionally. While that’s cooking, crack 2 eggs into other side of the pan, cook it for a minute and flip it over and cook for another minute. Turn off heat, sprinkle pink himalayan salt over spinach and eggs. Serve them on a plate. Sprinkle smoked paprika and turmeric powder over eggs. Cut up some fresh cucumbers to serve alongside the other dishes. Once sweet potatoes are ready, sprinkle pink himalayan salt over it and serve with the rest. Add frozen banana, spinach, almond cinnamon, honey and chia seeds into food processor. 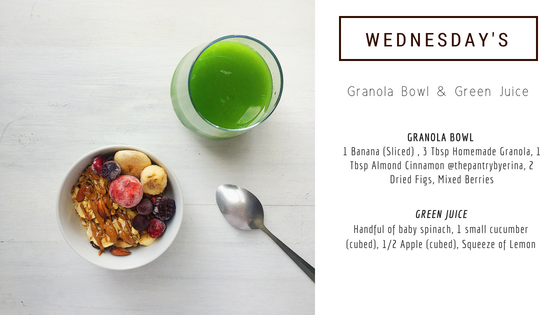 Add banana and homemade granola into a bowl. Drizzle almond cinnamon over it. Serve with frozen mixed berries and dried figs. 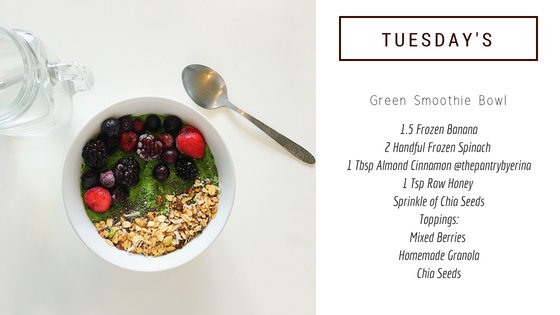 Add all ingredients into the blender. Process till it’s smooth. Add chickpea, garlic, cumin powder, turmeric powder, and salt into food processor. 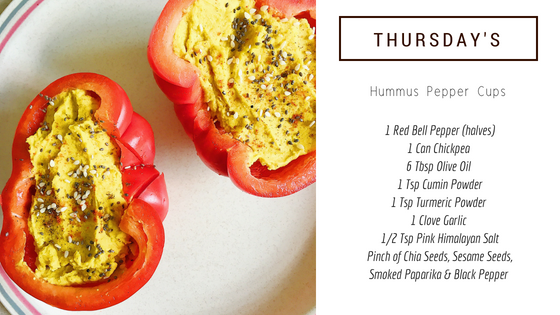 Fill up peppers with hummus. Sprinkle chia seeds, sesame seeds, smoked paprika and black pepper over it. Stir fry chopped kai lan in olive oil and garlic for a minute. Add 3 eggs into pan and give it a swirl to cover the entire pan. Cook for another minute in medium heat. Sprinkle smoked paprika and salt over it. Serve with roasted garlic dressing. 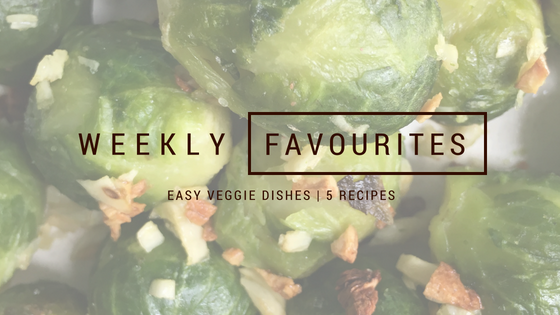 I hope these recipes will inspire you to make nourishing, delicious meals at home. It takes less than 15 to 20 minutes to put up any of these meals. Once you get cooking and enjoying meals like these, you will never want to have them any other way. So, cook, have fun and enjoy food! Remember to show somebody some love this week by giving, sharing, listening and encouraging. Macanese food can be something good for a change, especially when you are craving for the famous Macau-style chi pa pau or pork chop buns. When my wife and I visited Macau as part of our honeymoon to Hong Kong some 10 years ago, we just went crazy over the chi pa pau. Sounds crazy, I know, but that was what I had for breakfast, lunch and dinner for the few days we were in Macau! 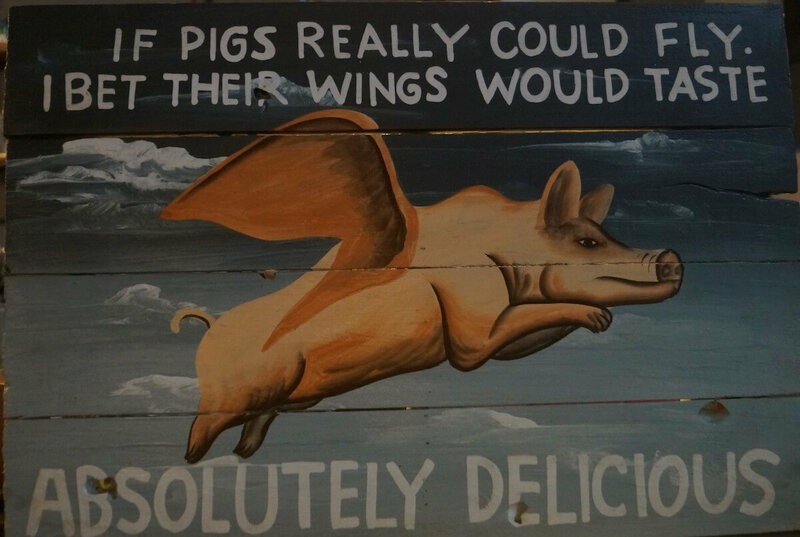 Now, when I think of the Cantonese name for the autonomous territory, which kind of sounds like ‘old moon’, I cannot help but think of the pig flying over Macau drawn on the wall of Fat Tea Macanese Food in Petaling Jaya. That was over three months ago, and I have been back many times since, particularly for their chi pa pau. Because as much as I loved the buns in Macau, Fat Tea’s chi pa pau taste even better! I am almost salivating thinking of the buns as I write this. 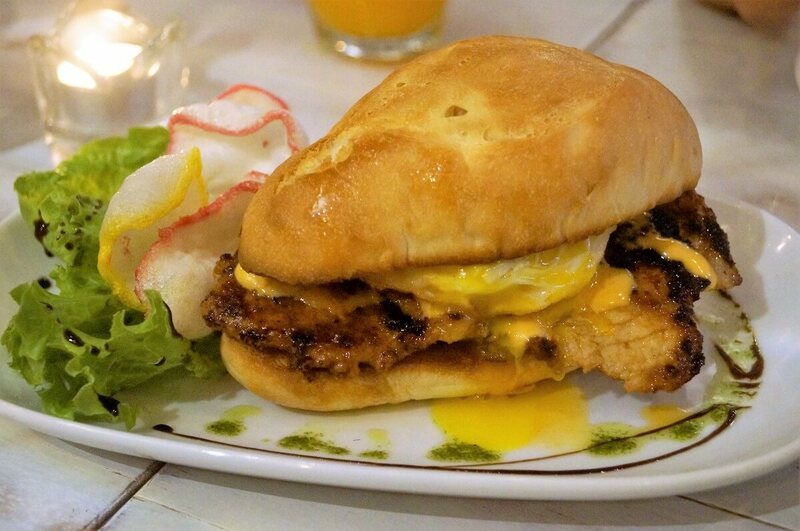 The chi pa pau is basically a buttered bread roll containing a delicious pork chop and a special sauce concocted by June’s partner and chef Susana Batalha. Of course, chi pa pau are not all they have. I would also recommend the po kok khai or Portuguese chicken, baked and cooked with turmeric and coconut milk, and which goes great with rice and salad. Minchi rice was the other dish that we had the opportunity to taste. 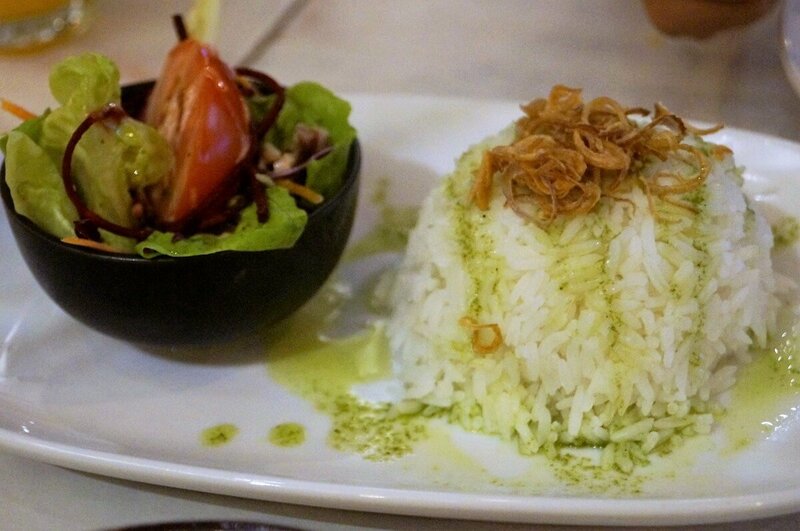 The Macau Tourism Office has deemed it their national dish, like nasi lemak is here. 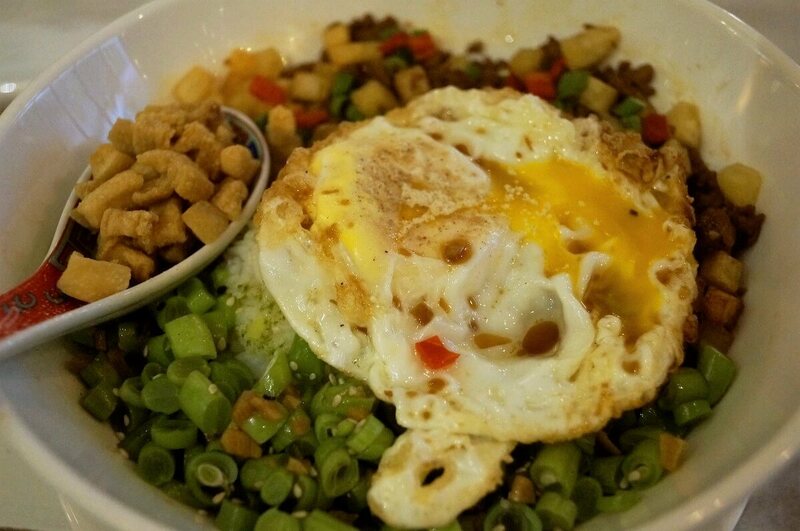 The dish comes with steamed rice, minced pork, onions, diced fried potatoes, fried egg, rice, veggies and chi yau cha. Batalha, a sixth generation Macanese, may look as Portuguese as you can imagine, until she starts mesmerising you with her near-perfect Cantonese! 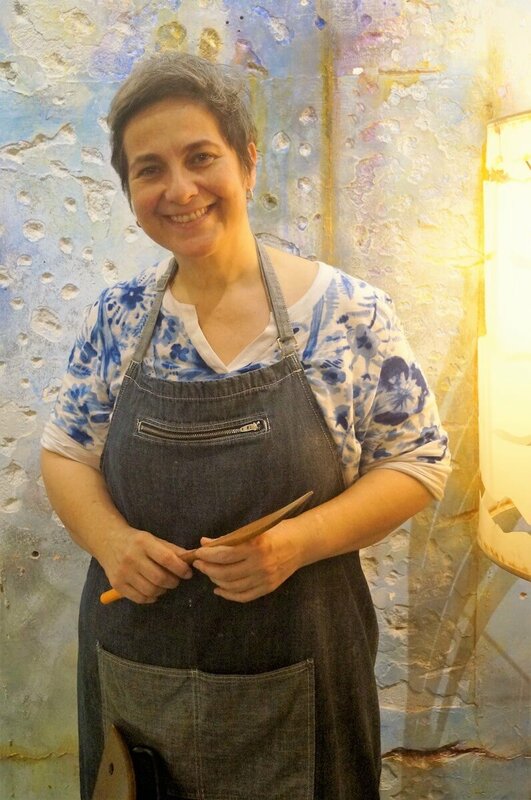 It is wonderful to know that her passion is cooking! There aren’t many places to find authentic Macanese food in the Klang Valley, which makes Fat Tea a real treasure. It is indeed a hidden gem, especially because its name gives no clue as to what kind of restaurant it is! I was left wondering, “Is this a tea house? A bak kut the shop?” Good job I walked inside and found out! But I learned that ‘fat tea’ is a translation of Cha Gordo, a gourmand affair for Macanese families for all the most important occasions. 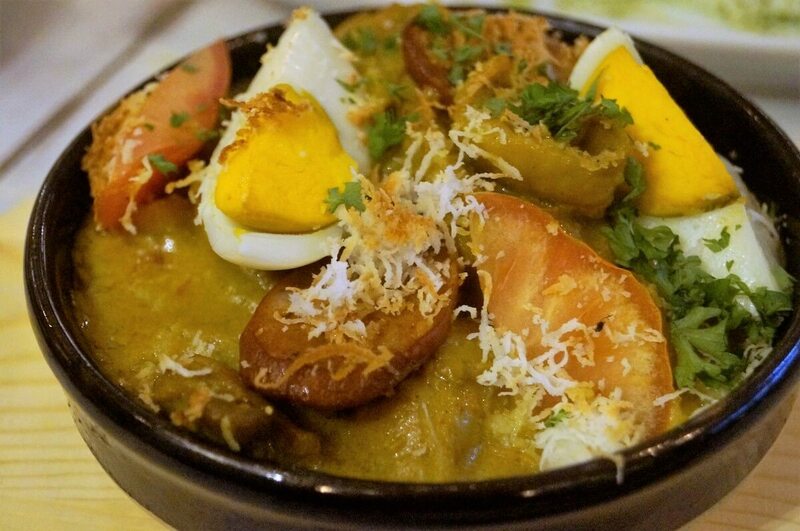 Like Malaysians, the Macanese also love their food – a fusion of Portuguese and Cantonese food – and celebrations wouldn’t be the same without it. 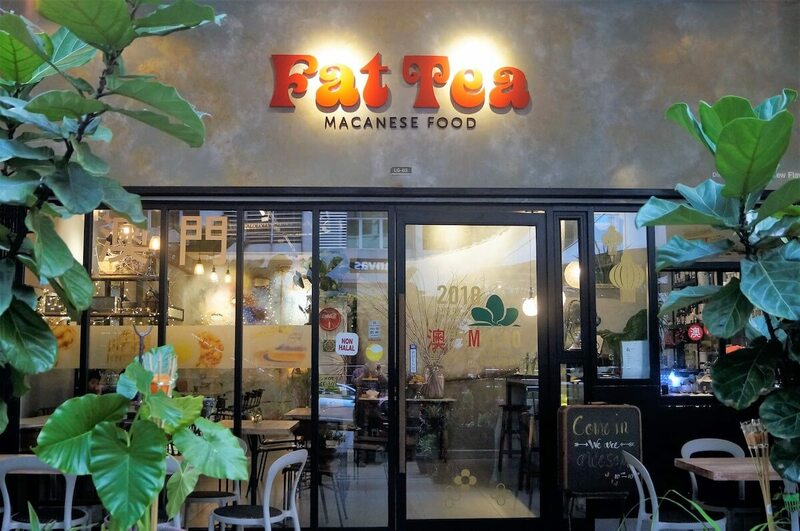 Fat Tea Macanese Restaurant is located at Unit LG-05, Plaza Emerald North, Jalan PJU 8/3A, Damansara Perdana.